Welcome to Twitter, and to #WBK10DoT! If you already have a Twitter account, then you could use this post to refine your profile and your overall aims and audience. What purpose do you want to set up an account for? With Twitter, you can have more than one account (each linked to a different email address), as, unlike Facebook or LinkedIn, it is not limited to single real life identities. Many people will start off with a personal, individual account to get used to Twitter, and then think about other ways in which they might use it to represent a group or service. For example, I’m both @cinigabellini for individual professional conversations, and also @WBK10DoT for this programme! You might wish to set up an impersonal account to publicise your department, or other activity such as a conference team, journal, research group, module or service like this one @ZentrumLL. If you don’t yet use Twitter, visit the site to set up an account. You’ll firstly need to enter a real name (will be the login name), email address and password to sign up and create an account. Different accounts will need separate email addresses. At the second stage, you need to think of a username, which will be your @name. This might be some version of your real name or, if your name is common and most variations of it have already been taken, you might think of a professional and memorable pseudonym which people associate with you in some way. Don’t worry – you can change this later without losing your followers or tweets, and you can also add your real name to your profile so that it’s identifiably you. Note that this username will be part of the twitter URL. The next steps of signing up on Twitter take you through finding people to follow, but I recommend you skip this step for now – we will look at it on Day 3! The next thing you should do is start to fill out your profile, so that when people look at it, they will feel more encouraged to follow you. Upload a profile picture. The picture should be smaller than 2MB in size. When skimming through a twitter feed of all the people they follow, an eye-catching profile picture will help them pick your tweets out. It could be of you, if you have a good, clear shot of your face (useful in identifying you when you meet followers in real life at conferences! Full body pictures work less well as at the size of a thumbnail image, it’s hard to pick out your face!). It could also be an abstract image which somehow reflects your @name, as long as it’s striking. You can also add a ‘Header’ image which customises your profile page a little more. If you are setting up an account for a service or department within your organisation make sure it meets the requirements of the corporate design. If available, also check the social media guidelines of your organisation. Add your real name, if you wish. This will appear on your profile, so if you use an abstract pseudonym and picture (like Helen Webster, for example, who calls herself @scholastic_rat), your Twitter account can still be identifiably ‘you’ – again, useful at conferences! If you use Twitter to represent a department or group, then the ‘full’ version of its title, especially if your @name is an acronym, would be something to add here. Add a location (this could also be an institution or other affiliation). Your followers might be from anywhere in the country or the world, so this gives people a bit more context about which university or HE body you are affiliated with, lending you credibility and authority. Add a URL to a personal website or webpage. You can have only one, so perhaps your university webpage, if you have one, would be most appropriate here. People can then find out more about you than is possible in your Twitter profile. Add a ‚bio‘. You have 160 characters to sum up who you are and what you might be tweeting about, to encourage people and give them a reason to follow you. Again, a blank or minimal bio isn’t very inviting, and suggests that you are too new to be interesting, that there is little to be gained from following you, or you are a spam account. A well-thought out bio is an important part of gaining new followers. Have a look at the bios on other tweeters’ profiles, and see what you find inviting or off-putting. Some people like to add that they are “tweeting in a personal capacity” or that the “views are my own” to clarify that their tweets do not reflect the views of their employer, although you may feel that this is clear enough anyway. You can connect your Twitter account to post automatically to your Facebook account too, if you have one. Think carefully about the two audiences for Facebook and Twitter – is this something you want to do? Or would you rather keep them separate? 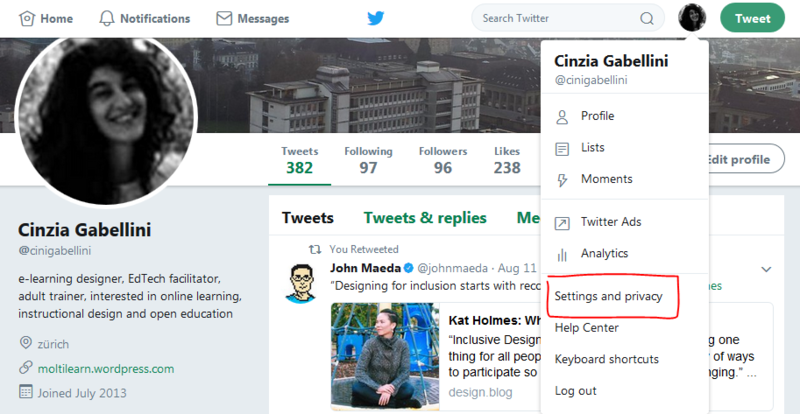 In addition, you can change your Header photo – the one the top that sits behind your avatar – or change the ‘theme color’. Click the ‘Save Changes’ button when you’re happy with the results. To change other settings, click on your small Profile Picture at the top of the screen, and select „Settings and Privacy“. By default you will receive notifications of various Twitter activities by email, which can be a bit annoying. Under ‚Email notifications‘ you may deactivate all notifications for the moment and come back later to refine your email preferences to be notified about specific activities. Visit the twitter help pages on how to manage your account for more information. You can create more Twitter accounts from other email addresses for other aspects of your life, and it’s best not to mix content and audiences too much – for example, if you use Twitter for a hobby, then a separate account for professional purposes means that you aren’t filling people’s Twitter feeds with things that don’t interest them or confuse them. It’s fine to add a personal touch to your professional tweets though! That’s enough for now, take you time until Monday August 29, 2017 to create an engaging profile, which invites others to follow your tweets. Be aware that you still can change settings later on. Let us know how you’re getting on, why not leave a comment on this post a link to the URL of your profile? Look at the web address in your browser web address bar, this is your twitter url. Or if you have any other comments or questions, let us know by leaving a comment! If you’re finding it hard to get in touch through the blog, do email me. Ten Days of Twitter for Adult and Professional Education will start next week on Monday August 29, 2017, and I’m really looking forward to meeting you online, exploring Twitter and joining in the conversations. I’ve found it an invaluable way to share information and resources with others. I hope you find it a positive experience too. We’ll be going at a manageable pace – one small aspect of Twitter each day – each day will need about 20 – 30 minutes for you to cover the basics. If you get a day or so behind, don’t worry though, it’s easy to catch up when you have time, the blog posts will all still be there, and I will still be around on Twitter to say hi! If you have time, there are some extras to explore, also spend a little time engaging with your Twitter feed and interacting with your new followers – it will be worth investing a little extra time if you’re able to! In order to participate in this course you will need a Twitter account. Setting up an account on Twitter is the easy part! There’s still a few things to think about, as Twitter is a very public social media channel. Some prefer using a test account first to explore twitter within this course until they get used to, others will start off with a real name using a personal, individual account or wish to set up an impersonal account to publicise a department, service or group. This information is covered more on detail on Day 1, and for your convenience it will be published this week on August 24, 2017, so you will have enough time to get prepared for your account setup. Where does the course happen? Daily Tasks and general course information will be published on this blog and from the @WBK10DoT course account, conversations through my individual account @cinigabellini. If registered you will receive the daily task information by email. If you have any questions or comments, do leave them in the comment field below. If you’re finding it hard to get in touch through the blog, do email me. By the way, you can comment, email or tweet in German, multilingual tweeting is quite common.